You've packed your duffel bag, cut back and repacked, gotten your passport in order, winced your way through the vaccinations, researched the culture and learned critical phrases in the native language. Perhaps you've been so busy preparing to do mission that you've overlooked preparing to be mission. Sometimes, it's only after you return from a journey that you realize just how much you received compared to what you gave. Mission trips and alternative spring breaks are on the rise. Millions of youth and adults are taking time to help people in need across the state and across the globe. In a world torn by misunderstanding and inequalities, making sure missions are mutually beneficial and just instead of patronizing is an urgent concern. Learn to transcend personal experience and connect your itinerary with the gospel — even before you leave home. "Seeing the larger story helps mission team members connect their travel experience to their ongoing life of faith," writes Richter. "Instead of viewing their lives as a series of random, disconnected episodes, Christians are challenged to view their activities in relation to God's activity. 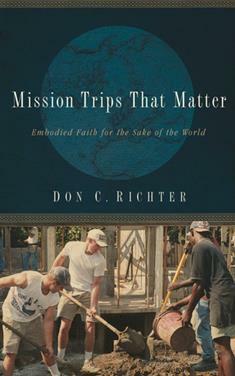 Guiding folks into this way of thinking about life is at the heart of leading mission trips that matter." Discover how to personify Christ's love, becoming servant-guests, as you help others through projects in unfamiliar places. During such pilgrimages, you'll experience and foster community as well as learn, firsthand, about the world beyond your homebase. Mission Trips That Matter will inspire and guide groups to reflect on your life together before, during and after your travels. It will also encourage you to model "Here-as-well-as-there" Christian practices.